The Travelling Lindfields: Drive a car in Lima! Are you crazy? Drive a car in Lima! Are you crazy? David is in his element - never happier than when he is behind the wheel of a rental car in a city in which no sane tourist would ever consider driving. 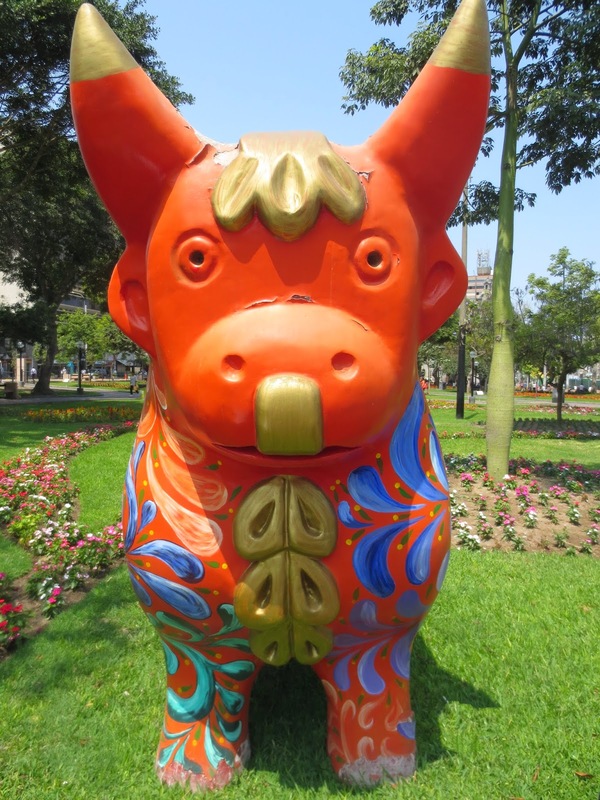 Yesterday we wandered the streets of Miraflores by foot. An easy, stress-free day after our exhausting flight and arrival in Lima. Today we have hired a car. It is Saturday and the theory is that Lima's traffic will be less chaotic on the weekend. We have the car for two days. 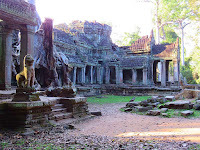 Today we will stick to the area near our hotel and tomorrow venture a little further afield. Miraflores and it's neighbour San Isadro are upmarket suburbs where the wealthy fled when the centre of the city became unsafe in the 80's and 90's. The Shining Path (remember them?) made the countryside so unsafe that millions of ordinary people crowded into Lima, bringing with them unemployment, poverty and, inevitably, crime. Almost two thousand years ago Miraflores and San Isadro were home to a different elite. Long before the Incas made their impact on Peru, the Lima culture were busy building adobe brick pyramids. Unlike the Egyptian pyramids these structures were built not by slaves but by the ordinary folk as a form of paying taxes. They were used for administrative offices, defence (because they allowed a view of the surrounding countryside) and human sacrifice. Except for the sacrifice bit (maybe including it) they don't seem to have been that much different to our own Parliament house in Canberra. The two best are Huaca Pucllana and Huaca Hallamarca. I have no idea what 'Huaca' means, maybe it is Spanish for 'pyramid', but somehow I doubt it. 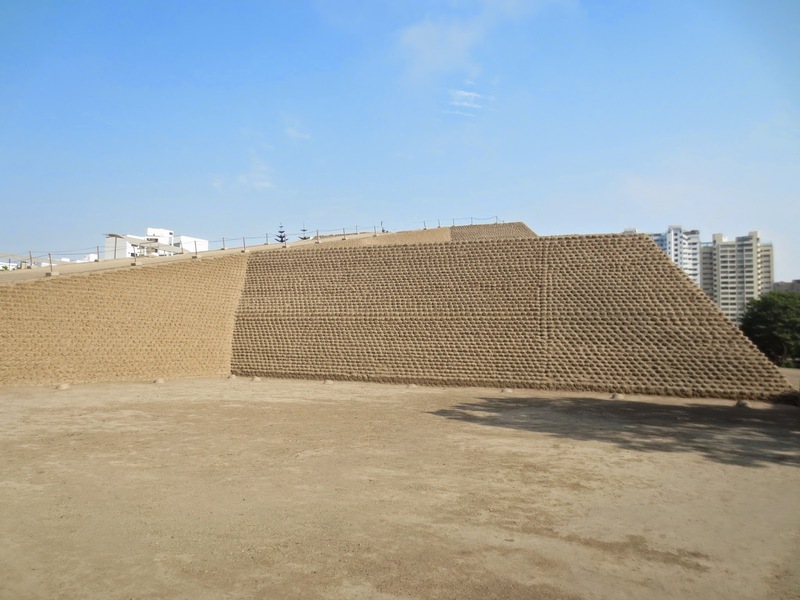 Huaca Pucllana is in 'not quite original' condition - adobe bricks tend to wear if you don't keep repairing them. 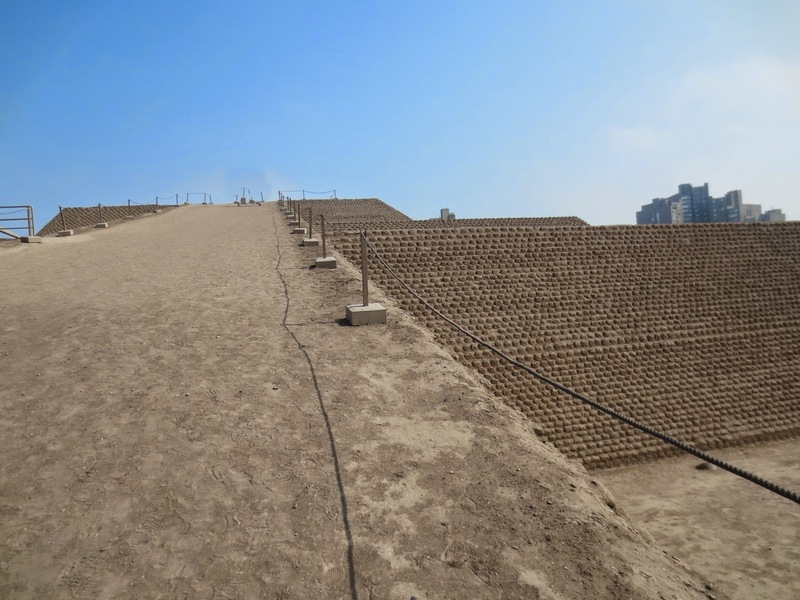 Huaca Hallamarca has been completely restored. Both are massive. I am a sucker for a good pyramid and had a great day. David is bored rigid by anything built before about the 16th Century but he did enjoy driving up to the attractions, parking right in front and, even better, just getting into the car and driving away while all the other tourists were wandering off looking for non-existent taxis. Fascinating blog! Thanks for connecting with us on Twitter! Keep up the great work and travel safe!